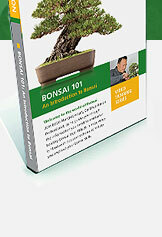 Created specifically for beginners, "Bonsai 101" presents a comprehensive guide for the basic care of bonsai trees. Even if you have never owned or cared for a bonsai before, this detailed program will provide you with the information you need to get started and maintain a healthy, beautiful bonsai. If you've been interested in bonsai but not sure how to get started, "Bonsai 101" is the ideal guide. Even after you've watched the entire program, individual chapters can easily be found on the program menu, making this a handy reference tool.